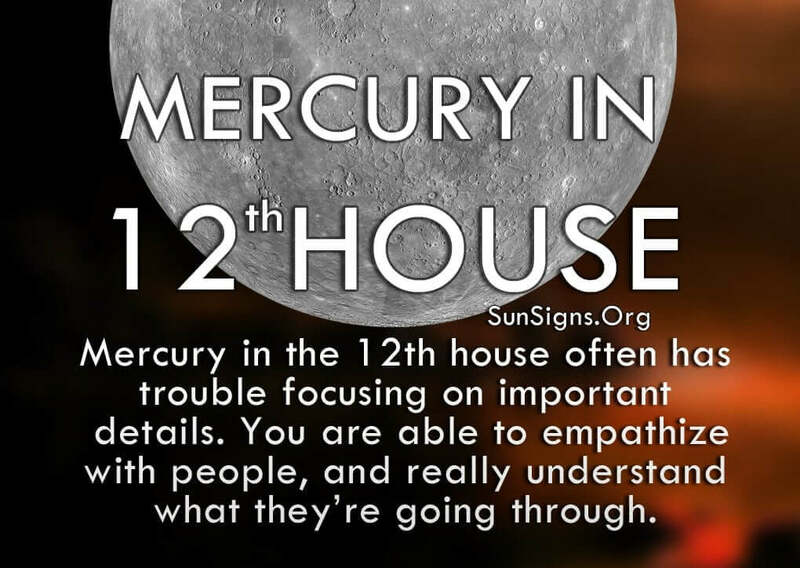 Sometimes you have problems communicating effectively because Mercury in the 12th house often has trouble focusing on important details. You need things presented to you in a more abstract light, and that doesn’t always work for the other person. You have to learn to adapt to other people’s conversational styles. Because you lack confidence, you’re not always sure what to say. Mercury is all about communication, interaction, processing of information and how we express ourselves. In the 12th house, that ability is muddled. (Read about Mercury symbolism). You are a great listener, and people know they can tell you anything and you won’t tell a soul. This also means you are able to empathize with people, and really understand what they’re going through. This is mainly because Pisces is your ruling zodiac sign. The one thing the Mercury in 12th house have going for them is their amazing intuition and psychic powers, so use it to your advantage. Your sensitivity doesn’t have to be your downfall. Because you listen so well, you can pick up on subtle conversational cues from other people and follow their lead. You often have a large social circle because you accept people from all walks of life. So use that network to practice different debate tactics. Even a simple friendly discussion can help give you the confidence you need to speak up and say what’s on your mind. And if you start to feel stressed take some time to yourself and regroup. The Mercury in twelfth house astrology predicts that you have a tendency to let your mind wander. Daydreaming is a big part of your everyday routine, and not everyone knows about your fantasy world. Those closest to you know you mean no harm when you’re not completely present, but others may think you rude and get offended. And when you try to explain it to them, it sounds like you were bored by their company. This only flusters you more and then you shut down completely. You have to learn to pay better attention to people, especially if it’s for your job or a romantic partner. You have to prioritize the things in your life that are most important and really focus on those things. While you have trouble remembering little details, you’ll at least have an idea what was going on around you. Showing a little bit of initiative goes a long way, but you have to put in the effort. Examine people’s conversational styles and really listen to how they present their ideas, and then play off of them accordingly. The Mercury in 12th house people recognizes that sometimes all a person needs is a shoulder to cry on and you give that to them. But when it comes to your own wants or troubles, you’re not sure the best way to convey your thoughts or feelings. You get nervous talking about yourself, as you’re usually doing things for other people. That’s when you feel most useful, and talking about yourself doesn’t fall into that category. There’s nothing wrong with wanting to be alone. Just remember you have as much a right to express your opinions as everyone else. And telling others about your hopes and dreams may help to make them a reality. You never know – they may be able to think outside the box and take you where you want to go. So if you have a goal but are having trouble reaching it, ask your friends and loved ones for advice. You’ll be thankful you did.